Did you ever wonder why there is so much fighting in politics today? 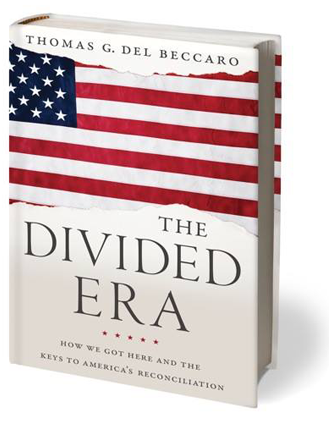 Tom Del Beccaro, in his ground-breaking work, The Divided Era, answers why. The larger our governments, the greater the competition for their spoils–therefore our divisions. ”There simply is so much at stake today. As a result, our governments that benefit so many, employ so many, and tax so widely–in short our governments that pick so many winners and losers–are understandably subject to an intense competition for their control.” So writes author Thomas Del Beccaro in this fascinating study of the history of political unity and division in the US, from the Revolution to the adoption of the Constitution, the Civil War through Reconstruction, The Gilded Age to our present Divided Era. While we have had our conflicts over large issues and the role of government in the past, and still do today, an emerging cause of the partisanship and division we now know today did not exist at our nation’s founding. Our governments were smaller, levied minimal taxes, and thus held out fewer spoils for citizens to fight over. Can the US find its way back to being a less divided country? Yes, says Del Beccaro, but only if citizens understand the growing source of our divisions: ever larger governments. Americans must demand that government shrink back to a less divisive size and scope and support leaders capable of setting unifying goals–for which Del Beccaro offers five key strategies. In fact, the consequences of not slimming the behemoth governments–federal, state, and local–will only lead to an ever widening divide, and more acrimonious and harmful partisanship.